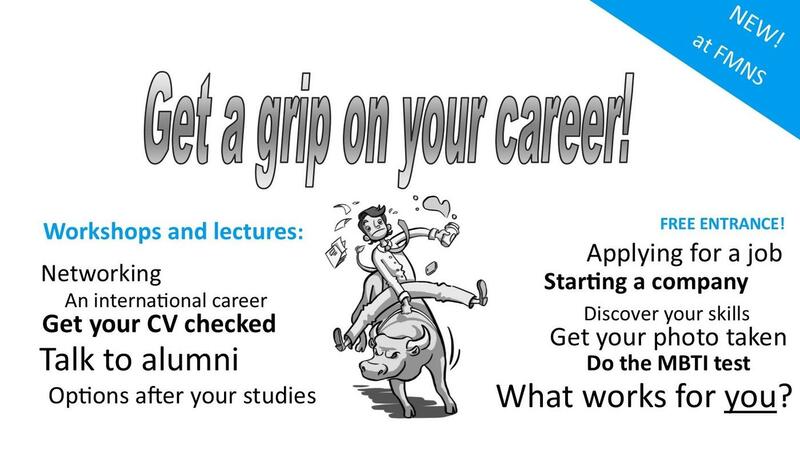 On the 26th of November the first Career Day for Master students of the FMNS takes place! This event, which is open for all the faculty’s Master students, is all about the skills a Master student needs for starting their career. The Career Day offers more than twenty workshops and presentations about finding and applying for a job. Workshops vary from mock job interviews and networking to doing the MBTI test. Furthermore, there will be presentations from alumni and several information sessions on, for instance, starting your own company and working abroad. Thursday November the 26th is intentionally being kept free from lectures for first-year Master students. The Career Day is organized by the Faculty’s Career Services, the Study Associations and the Graduate School. Taking part is free for Master students thanks to the support of the Graduate School of Science and the Centre for Entrepreneurship.